The cold weather is fast approaching and I am NOT a big fan of the cold AT ALL. How about you? The winter is so cold here in NY. Yeah, I know it is MUCH colder in other places like Canada and Alaska, but I am just not a cold weather girl. I would much rather live in a tropical climate (and we may someday, who knows). We have been doing a lot of preparation for the upcoming winter months, such as: weatherize windows, put away outdoor furniture and toys, remove air conditioners from windows, etc. As we were cleaning we found the kids swings that we had up at our old house. Unfortunately we do not have a tree that can fit both swings, so we decided not to put them up because they would just fight over who gets to ride the one swing. But then I came up with the bright idea of hanging the swings from the ceiling in the basement. The basement has become the kid’s playroom. It is filled with toys and bikes and everything else. But the kids were THRILLED about the swing idea. My husband drilled holes into the wood rafters. Our basement ceiling is not finished so the rafters are exposed. Wound up working out nicely. I think this will work out well, especially in the winter. I love that my kids have their own space to play. In our old house they did not have that, so this is definitely a plus in our new house. And in the picture above, that is only a small portion of our basement. It is really a big space. And now it is a basement with swings. I think we are going to bring the kid’s small sliding board inside next. How about you? And of you use the basement for a playroom? Ever try swings from the ceiling? very clever! they will be the envy of all the neighborhood kids! I am glad to see that your kids have a place to play on the inside now. I am not a cold weather girl either. My favorite season is Fall because it’s not too hot and not too cold. My kids will be giving up a playroom in our current house, because we are downsizing (and our landlord is a slumlord) to an apartment. Being a single mom means that we have to cut back on living space but as long as we have each other that is all that matter. I am really sorry to hear about your landlord. That is so tough to deal with. And yes, though you have had to downsize for now – it is most important that you are together with your family. Just remember that God has a plan and a purpose for your life. You are special in His eyes and He loves you more than ANY human being on this earth. Keep the faith girl and don’t give up. I am here for you if you ever want to talk. God bless! Very cool idea, Dawn! I’m not a cold weather gal, either. I live in the desert but we get very chilly am’s and pm’s in the winter and it’s also too damn windy almost year around. BUT- this November has been strangely warm. It’s really odd. I’m not complain’ because I’ve been able to take the boys to the park and we’ve can still take an afternoon walk. Yay! Your kids will so love you for that when it’s actually snowing. hee, hee! 🙂 Stay warm! 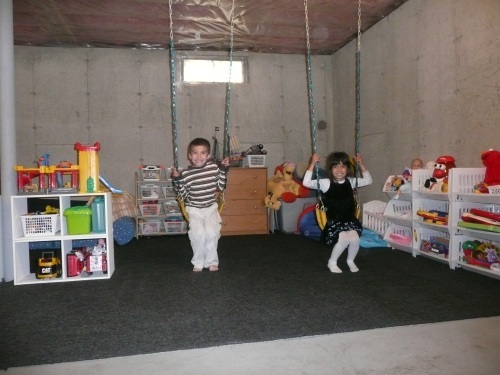 I just love the swing idea and how organized your basement is! I found you through someones video on youtube and I enjoyed watching all of your videos…you are so neat and organized…I am in awe 🙂 I too am not fond of the cold weather…you think I would be used to it since I’m from New Jersey. Blessings and a Merry Christmas to you and your famly. Thanks so much Janel! A fellow Jersey girl! I grew up in Union County. I do need to make some more videos. It has been a while. I have 4 little ones now so I don’t have as much time as I used to. I am so glad you like the swing idea. We just added one more so we now have 3 because our 2 yr old was fighting to get a turn. Now he has his own. Yay! Anyway, thanks so much for stopping by my site. Merry Christmas to you as well! What did he use after drilling the holes? Any pics?